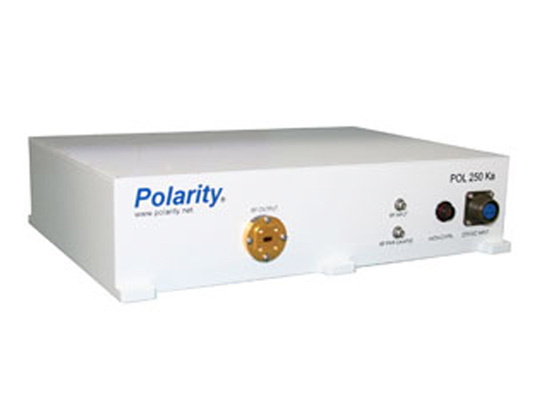 450W Peak Ka Band HPA | Polarity Inc.
Polarity hits a high speed performance benchmark with its ultra-lightweight 450W Ka pulsed amplifier. Building upon Polarity’s previous airborne design and high modulation rates, the new Ka band pulsed TWT amplifier can run continuously at rep rates above 1MHz and short bursts at 2MHz. This TWTA amplifier is ideally suited for short range, high resolution radar systems. The POL450 Ka transmitter covers a frequency range of 32GHz to 36 GHz and provides 450 Watts of peak power at 33% duty. This TWTA radar transmitter was designed for either ground mobile or airborne systems. Outstanding thermal design ensures reliable operation from ambient temperatures of -40C to +75deg C. The POL450Ka – P offers a design with industry leading reliability and its power supply design ensures rugged performance that is unmatched. This high efficiency transmitter design meets the demands of today’s complex pulsed microwave radar systems. The POL450Ka offers a design with industry leading reliability and rugged performance that is unmatched. With more than 40 years of high power supply design experience, Polarity amplifiers continue to lead the industry in weight, efficiency, and performance.